Shale shaker is the first stage of solids control system ,which can separate the solids bigger than 70microns. 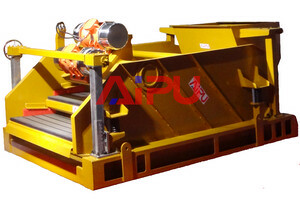 Aipu Solids Control can design double shakers and triplicate shakers on single skid according to clients’ special requirements and also supply relevant connecting manifold, according to current industry situation, Aipu provide both third generation linear motion shale shaker and fourth generation balanced elliptical shale shaker. Shale shaker called vibration device is the first stage oil field solids control equipment. Usually it can separate solids larger than 74 microns. The drilling mud flows through the high set pipeline get to the baffle box on the shaker or directly to the distribution box. Then it begins working to shake the drilling mud with solids. After processing, the solids will be smaller than 74microns. The clean mud will fall into the shaker shaker compartment or settling compartment. Then the afterwards equipments will do following processing, such as desanding, desilter, and so on. Hence, the shale shaker is the key equipment on drilling mud system. Imported Motor: Aipu uses imported short motor from Italy to provide a strong commonality and reliable performance. High Strength: Made by alloy steel metal material for a high strength guarantee. Fatigue Resistance: Heat treatment of screen box eliminates internal stress completely. Adjustable Vibration Intensity: Adjust vibration intensity through eccentric block of motors. Splash Prevention: Splash prevention intensity through eccentric block of motor. Obliquity adjustment: Adjust obliquity safely by ratchet gear. Compact Structure: The length is 3m including 2.65m safe length. Muti-Purpose: With auxiliary function of emptying valve, uniform flow baffles plate, etc. Aipu solids control can produce all kinds of shale shakers with different sizes and types, can meet the requirements of different handling capacity and installation sizes. We can also produce duplex or triplicate shale shakers according to the actual requirements of clients and supply the corresponding pipelines. Shale Shaker is one of the key solids control equipment in oil field drilling mud solids control system. Such system requires a whole set of equipment to achieve the solids control target, including shale shaker, desander, desilter, vacuum degasser, sand pump, mud agitator, mud/gas separator, decanter centrifuge, as well as other devices. Aipu solids control also provide you above equipment to meet you requirement of the whole drilling system.